Peter Tudehope (second from left) with TAA, government and industry colleagues last night. Tourism Accommodation Australia NSW Chairman has reinforced calls for government regulation into the short-term letting industry as booking numbers continue to rise in the sector. 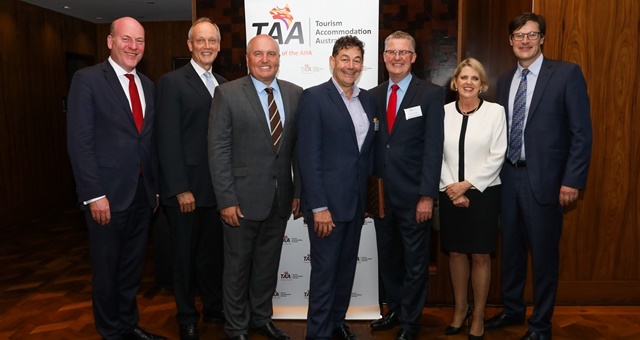 Speaking to industry colleagues at the 2019 TAA Chairman’s Drinks event at the Sofitel Sydney Darling Harbour, Tudehope said the government’s 12-month review into the sector would be “meaningless” without a full and proper Code of Conduct and registration requirements for properties on Airbnb and other home-sharing platforms. “Recent IVS data shows that there remains considerable ‘leakage’ into the short-term rental accommodation market, which faces none of the regulations imposed on our sector,” he said. Initial steps into regulating the short-term letting market are being taken by the NSW government. In 2018, Minister for Innovation and Better Regulation, Matthew Kean, tabled a bill allowing strata corporations to ban Airbnb and similar letting of apartments in their buildings. Violations of the bill would see offenders banned from using the service and placed on an exclusion register. The government said measures would be reviewed a year later to ensure they were delivering on intentions. Tudehope also acknowledged the work being done at a federal level to ensure unregulated operators were paying their fair share of tax on earnings derived from home-sharing and short-term letting. The NSW government was praised as a major contributor to the success of the state’s tourism industry, having committed $173 million to be used to promote the state’s attractions and to provide confidence to investors, who continue to open hotels across the city’s fringes and outskirts. Tudehope mentioned new properties such as Veriu Central, SKYE Hotel Suites, Four Points by Sheraton Central Park, The West Hotel, Curio Collection and many others which have opened their doors in the preceding 12 months. “What has been so encouraging about this investment is that the projects range from luxury international brand names to intimate boutique hotels traversing a vast range of styles and price points,” he added. Tudehope also paid homage to the growth in regional nights which has come from ongoing government investment in Destination NSW, which has seen travellers and business events venture outside the city to explore the outer regions of the state.